The process by which green plants and some other organisms use sunlight to synthesize nutrients from carbon dioxide and water is called photosynthesis. Photosynthesis in plants generally involves the green pigment chlorophyll and generates oxygen as a by-product. Plants are called autotrophs because they can use energy from light to synthesize, or make, their own food source. Many people believe they are “feeding” a plant when they put it in soil, water it, or place it outside in the Sun, but none of these things are considered food. 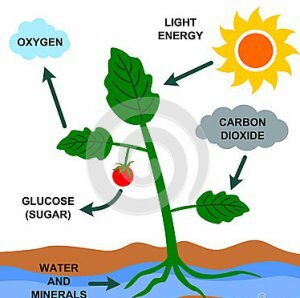 Rather, plants use sunlight, water, and the gases in the air to make glucose, which is a form of sugar that plants need to survive. This process is called photosynthesis and is performed by all plants, algae, and even some microorganisms. To perform photosynthesis, plants need three things: carbon dioxide, water, and sunlight.